Are you already playing out scenarios in your head about what could go wrong this holiday season? Maybe you are tired of feeling uncomfortable around the in-laws, or dreading the arguments that tend to come up between you and your partner. With so many different personalities and conflicting desires coming together, it can be challenging to stay centered and feel enthusiastic about the holidays! …Which is why I have put together some tips for you. Who says this year can’t be different from the others? 1) Take initiative. If you usually take the “I’m just along for the ride” kind of approach, try something different this year. Take initiative and suggest activities that the whole family can enjoy together, such as playing board games, sharing photos, watching home videos, or going for a drive. Activities that encourage shared laughter or stimulate conversation can help unite the family. And who knows, you may be surprised at how much fun you can actually have at holiday gatherings. 2) Realize that it’s not personal. Chances are others may be feeling stress or anxiety, too, at least on some level. These people (including your partner) are not out to ruin your holiday. We are all biologically wired with the desire to connect to others and to feel accepted. If someone is acting less than pleasant to be around, they are perhaps feeling unheard, left out, conflicted—basically having their own experience. Realize that they are probably unaware as to how it is affecting you, and that it is not a personal vendetta toward you. Respond from a place of compassion instead of a reflexive reaction, and see how you feel afterwards. 3) Engage. Ask people questions about themselves. It’s a great way to get a conversation started, and to increase comfort levels around one another. Plus, everyone wants to feel seen, so people feel good when others take an interest in them. Just this alone can get a good vibe going within the group. 4) Practice self-care. Pay attention to how you are feeling and resist the tendency to “power through it.” If you are flooded and need some space away from the others for a while to refuel or get re-centered, do it. Go for a walk, watch some TV, read a book, or a take a nap. Doing any of these can lower your stress level. 5) Communicate, communicate, communicate. 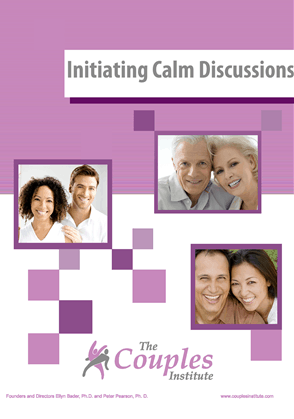 Initiate a discussion with your partner about what each of your hopes and your concerns are BEFORE the holiday season. Explain to your sweetie what your past difficulties have been and ways that he/she can be supportive of you. Ask your partner to share this same information with you. If you discover that you have conflicting desires or hopes, give each other the space needed to get everything out in the open first. After this step is done, then some negotiating may be in order. Communicating in this way before the holidays can prevent many misunderstandings, disappointments and unpleasant encounters. Then you have more room for creating fun memories together. Michelle Wangler, MFT has been employed at the Couples Institute since 2002. She currently sees couples and individuals in Menlo Park weekdays and evenings.